This book continues the tradition that Stirling never writes sequels to the books of his I like best. Ah well. To Jerry Pournelle, for help and assistance; Giovanni Spinella and Mario Panzanelli, for help with Sicilian dialect; Steve Brady, for Afrikaans, Greg Saunders, for local knowledge of LA; to the Critical Mass, for continuing massively helpful criticism; and any others on the list. All faults, errors, infelicities and lapses are my own. "There is a technical, literary term for those who mistake the opinions and beliefs of characters in a novel for those of an author. I suspect the last entry was necessary because all of the major players in this book are 'deplorables', to use an anachronistic term for a book written in 2003. Un-reconstructed Southerners. Former Waffen-SS. Pied noirs, white Rhodesians, and Boers. 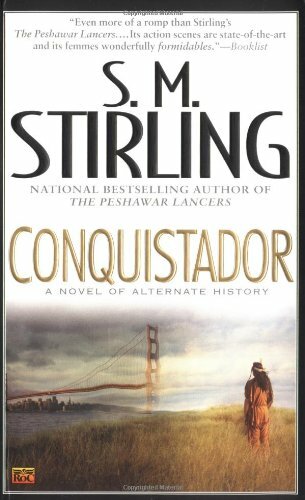 As a high concept, this book seems to be about: what would happen if all of the losers of Western Civilization's great internal conflicts got together and created a new society free from the influence of history's winners, but the losers could take any knowledge [cultural or technological] they wished into extra-dimensional exile? Stirling's answer turns out to be pretty interesting. For example, the Commonwealth of New Virginia, is an environmentalists paradise: completely sustainable, driven largely by renewable energy, with strict limits on urban sprawl and massive reserves of untouched wilderness. The alternate history California of Conquistador is a prose poem to Nature along the lines of Steve Nichols' Paradise Found. Or perhaps I should say it would be an environmentalist's paradise, if you could separate environmentalism from the political Left. There is plenty of mining and hunting, because the New Virginians are conservationists of the strict observance. They preserve the wilderness because it is pretty, and because animals taste good and look nice as rugs. The social arrangements of the Commonwealth are similarly perplexing, if you insist on maintaining the alliances of convenience that characterize current American politics. Political power is concentrated in the Thirty Families, the descendants of those who settled the New World. The head of each family sits on a council, and their word is law. Yet, laborers have a great deal of power, due to a short supply of labor due to an extremely strict guest-worker program. The entreaties of beleaguered businessmen are dismissed with contempt. Fertility is high, as is religious observance. Free-thinkers exist, they just aren't paid much heed. Which isn't to say the state, such as it is, is theocratic. For historical reasons, the settlers largely brought Christianity with them into exile, but it seems to have been shorn of its universalizing tendencies. That may be because we mostly see the Commonwealth through the eyes of its masters, who are hard and unsentimental men. While there are some references to "missions", there doesn't seem to be anything like the Franciscan order that accompanied our world's conquistadors. Which makes sense, since the ruling elite wouldn't want anyone with real allegiance to a completely autonomous center of power, and largely come from places with strong traditions of political control of religion. Stirling's presentation of all this strikes me as bold and interesting, because he gives the impression that the Commonwealth of New Virginia isn't a terrible place to live. In fact, it is rather nice in many ways. It is sometimes unjust, as all states are, but it has more virtues than you might expect. Unlike his Draka series, this state founded by horrible people isn't a living nightmare. It is simply another place in the realm of possibility, that represents a slightly different mix of the features that make up the West. I want sequels because I would like to explore the future evolution of this society. I suspect that a Western polity that amputated the radical and universalizing features of Christianity would eventually turn into something quite different than what we see today. I doubt the result would be good, but I would say that. I'd like to see what Stirling's answer to that question is, but I suspect I won't get it. Which is a pity.